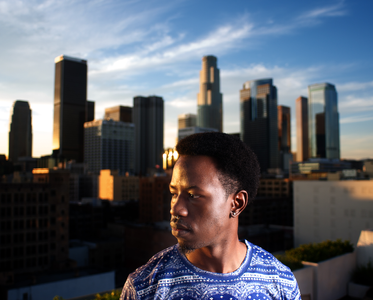 Last week I got a call about a new, unsigned artist in LA who goes by the name Steve Liriks. I met with Steve and we were able to make some fun images in downtown LA. 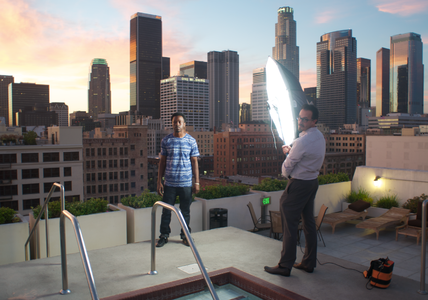 We capped off the day by shooting with a picturesque view of LA in the background from a mid-rise rooftop. Check out the behind the scenes picture and final image below. Steve even did an ACAPELLA FREESTYLE for us as well. The dude is amazing and I look forward to working with him in the future. Check out his website HERE. I'm a big fan of hip hop. I have been since I was a kid. I love the culture, its influence on young people and its way to 'sneak' art and poetry into tough guys. I also love how you can listen to good hip hop artists and, even after months of listening to the lyrics, and pick out euphemisms and metaphors that you hadn't noticed before. Over the last couple of years, I have had the opportunity to photograph some of my favorite artists. The opportunity started with a tweet to the Minneapolis based duo Atmosphere. Slug, Atmosphere's MC, responded and set me up with the PR director for the record label that Atmosphere co-founded, Rhymesayers Entertainment. A couple of weeks later I was photographing Slug ahead of the Atmosphere show at the House of Blues in Houston. Since then, I have been invited to work with several other hip hop acts, from hip hop collective Doomtree to the Seattle based duo Grieves and Budo. It's always fun to be introduced to fresh local talent, and Steve Liriks encompasses that to the fullest extent. I look forward to working with him in the future and also to see the dent he makes on hip hop.